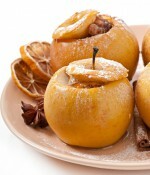 Spicy baked apples are the perfect dessert for the holiday season. This recipe has wholesome, natural ingredients, but you'd never know it from the taste. In a medium bowl combine syrup, cinnamon, ginger, cloves, oats, and the walnuts.